Leprechaun Canyon is a fun; physically demanding and a technically challenging adventure. The beauty of this canyon is spectacular; the narrows are extremely tight, dramatic, unrelenting and perilous. The canyon offers its enchantment with only a short approach hike. 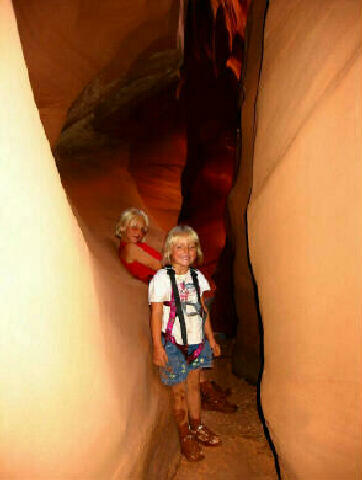 Leprechaun Canyon is the crown jewel and centerpiece of a group of canyons commonly referred to as the "Irish Canyons". Leprechaun Canyon offers a variety of routes to fit all skill levels from beginner to expert. The most advanced route option features what has become known as a "Mae West Slot", which is a "V" shaped slot so narrow that it is impossible to pass through. Descent requires moderate rock climbing skills to climb over or bypass the "Mae West" portions of the canyon. Leprechaun Canyon is part of the "Circle of Friends" program. Members of the "Circle of Friends" have access to more specific information, explicit route information, GPS waypoints, trailhead location and detailed maps. If you would like more information on joining the "Circle of Friends" visit the sign up page. 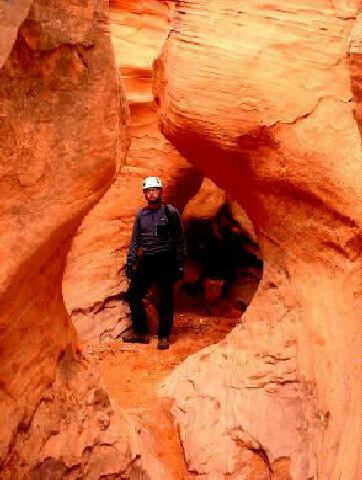 Leprechaun Canyon is a spectacular technical canyoneering adventure. Total descent time is 4 to 8 hours car to car depending on which route you select. I recommend a group size of 6 or less. 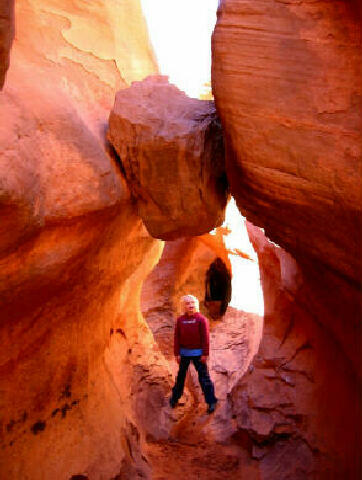 This is a physical canyon requiring constant downclimbing, squeezing, stemming and chimneying. Basic rock climbing skills are a must and sticky shoes are a bonus. 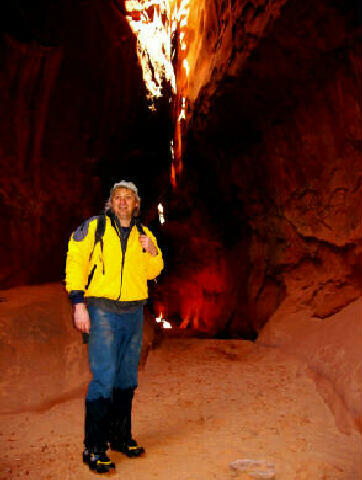 Leprechaun Canyon requires complete technical gear. During normal conditions you will encounter knee to waist deep wading but no swimming. There are no bolted anchors in this canyon. The canyon is to be descended from natural anchors. I strongly suggest a long sleeve shirt and long pants for this slot or you will lose a bunch a skin squeezing between the narrow canyon walls. Leprechaun Canyon has a Canyon Rating of 3A II or 3A III R depending on which route you select. This canyon has a moderate flash flood danger. 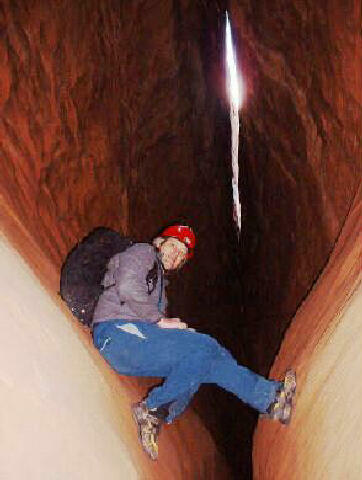 Check the local weather report before entering this canyon. Leprechaun Canyon contains an interesting dinosaur trackway. The site consists of about 6 or 7 large three-toed tracks probably belonging to an Allosaurus, which was the most common carnivore during the period in which this trackway was formed. Fossil footprints are a rare, non-renewable resource. Please help preserve and protect them. Large frame canyoneers will have extreme difficulty descending some route options in this canyon. My chest measurement is 43" around. There are sections of this canyon that I found very difficult to squeeze through. I highly suggest that you obtain a detailed description of this route before attempting it. Be extremely careful that you are dropping into the correct drainage. At least one rescue has resulted from a navigational error concerning canyons in this area. The cap can be confusing and all the canyons look similar from the top. After you pull your ropes there is no escape from several canyons in this area. You have been warned! The trailhead to Leprechaun Canyon is located next to a major highway in Southern Utah and is accessible to all vehicles in all weather conditions. There are several good primitive camping spots in the area. Enjoy a short HD video from the East (Right) Fork of Leprechaun Canyon in North Wash.
Leprechaun Canyon Rescue - Interesting and detailed story of a canyoneering rescue.